The Tandoor is a clay oven, which is fired with natural wood charcoal. All meats, poultry & seafood stay immersed in special marinades overnight, then are skewered & brolied in the Tandoor. The Tandoor is also employed to turn out a most exciting variety of fresh homemade breads. 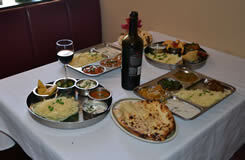 tandoori specialties come spiced between mild & medium. 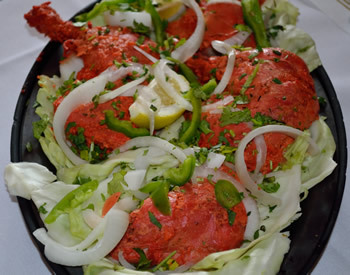 Chicken marinated in yogurt & freshly ground spices & cooked in the tandoor. Shrimp, fish, and scallops marinated in yogurt and special tandoori sauce.